The 2008 Physical Activity Guidelines for Americans, which have been adopted by the First Lady's Let's Move! initiative and the American Academy of Pediatrics, recommend that youth participate in daily moderate-to-vigorous physical activity for at least 60 minutes (1–5). About one-quarter (24.8%) of youth engaged in moderate-to-vigorous physical activity, including activities both in school and outside of school, for at least 60 minutes daily. Children should be physically active for 60 minutes every day, or most every day. Here are some suggestions for adding physical activity to a day. Enjoy games with friends or help around the house 2-3 times a week. Hopscotch, play on swings or climbing equipment, fly a kite, help your parents with yard work or gardening. Do aerobic activities 3-5 times a week – long walks, biking, running, swimming. Every day make extra steps in your day. Walk or ride your bike instead of getting a ride, take the stairs instead of elevator, help take out the garbage. Sit less – watching TV, playing computer games, listening to the radio or CD. Stretch and strengthen muscles 2-3 times a week – curl-ups, pushups, stretching. Enjoy sports 3-5 times a week – soccer, softball, other team sports, gymnastics or dance. Make activity a family affair. Take walks together, play volleyball, go hiking, swimming. 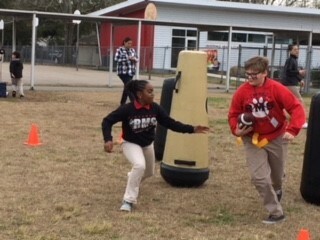 Students participating in the Fuel Up to Play 60 Saints Field Day event at Riverdale Middle and High School. Eating right and exercising are important for a strong, healthy body. Besides being fun, regular exercise helps you have a healthy heart and healthy blood vessels, strong muscles, healthy lungs, healthy bones. Being active also helps you control weight, sleep better, feel better, learn better and prevents constipation. We need to drink water every day. It is recommended to drink 8 glasses (8 cups) of water a day. More water is necessary when you are doing physical activity and when the temperature and humidity is elevated outside. Why is water important? There are many reasons. Water is necessary for metabolism and it keeps the muscles hydrated. Muscles are 75% water, and if muscles are dehydrated, they don’t work as effectively. The more muscles you have, the more water you need. Building muscles by weight training or exercises that are strengthening in nature require you to drink more water, also. Water keeps our skin healthy. The skin is the largest organ of the body, covering the entire surface of the body. Think you are hungry? You may just need a glass of water. Stay hydrated throughout the day. Physical activity is so important for children, adolescents, teens, and adults of all ages. You are always young enough to exercise. So, how can we stay more active? The key is to make physical activity a part of your lifestyle. Include eating healthy foods and exercise daily to control weight and prevent chronic diseases. This simple recipe for health will keep you strong, happy and vivacious. Life is meant to be enjoyed. Go play and have fun. Physical activity is fun.